Sometimes my travels seem to conspire against me. 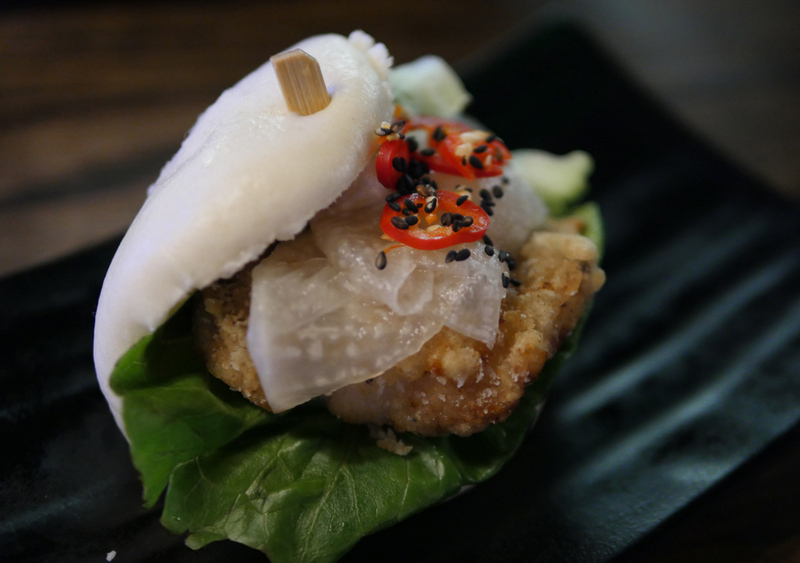 When the casual Asian restaurant Yuu Kitchen first opened, I really wanted to visit – but a series of back to back press trips meant that I simply couldn’t make the dates offered. Instead, the ever-enthusiastic Hedonist went along and came back to write a really positive review. So, this year, when London-Unattached was invited back I made sure that the date was firmly in my own diary. 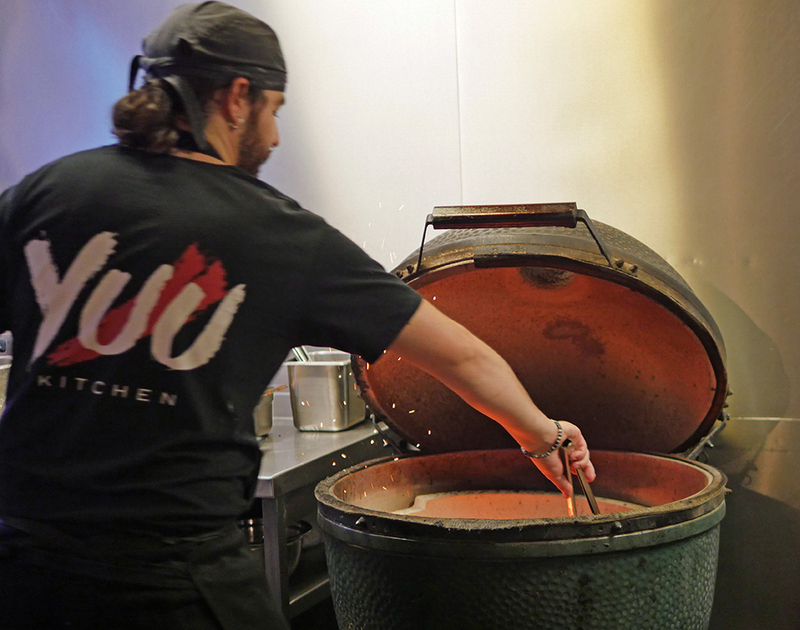 Yuu Kitchen is the brainchild of two experienced restaurateurs and friends, Stephen Lowe who is the general manager and Jon de Villa, head chef. 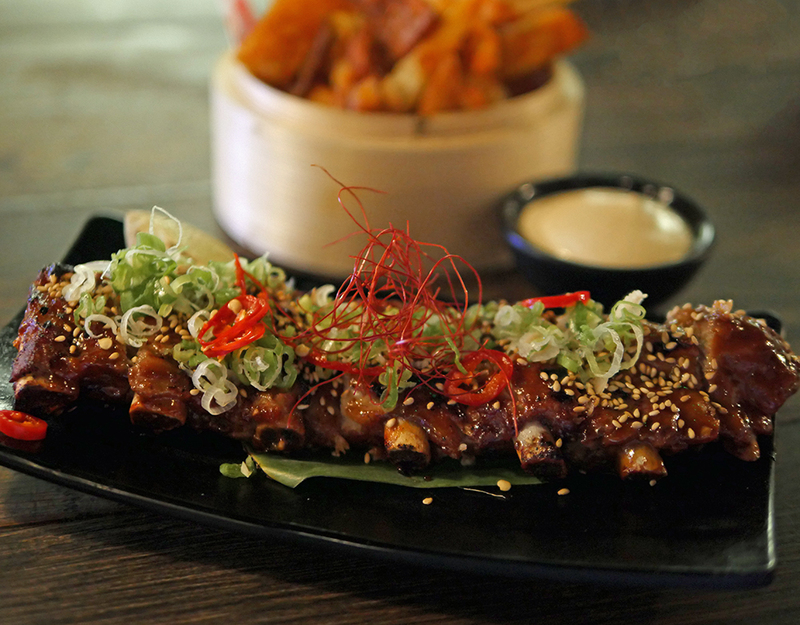 And the food is inspired by Jon’s heritage and his travels across South-East Asia and experience working at Nobu, Zaffarano and Bone Daddies. 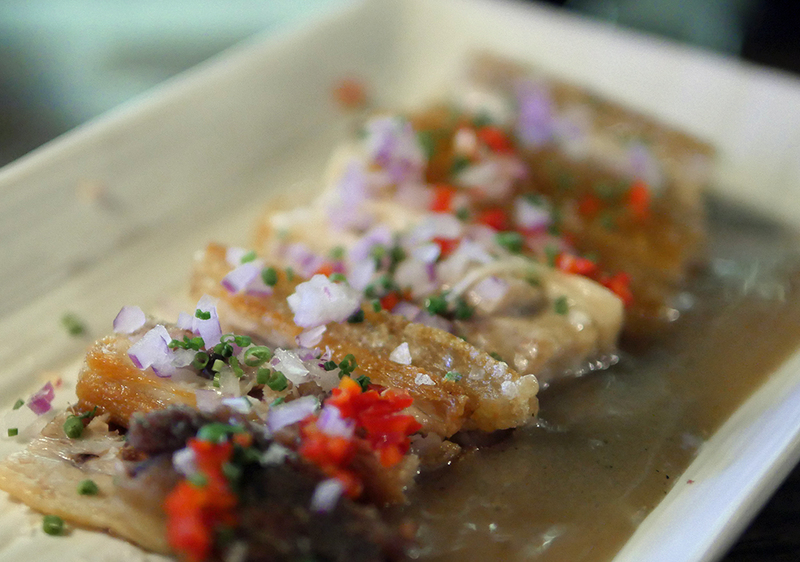 It’s one of the few places in London where you can find Pinoy cuisine – but there’s a lot more on the menu, including a rather special sweet and sticky eggplant which The Hedonist raved about, which I tasted and can verify is superb and which the kind people at Yuu Kitchen have shared with me so that I can share with you! I’m glad we arrived at the restaurant reasonably early because by the time we’d settled into our seats at the bar there was a queue building. Yuu Kitchen is informal and fun, with a mix of tables for two or four, large sharing tables and a section looking over the kitchen where you can watch the chefs at work. Even if, like me, you normally avoid bar stools, it’s worth the wobble for the culinary entertainment. And, as you watch dishes being prepared you may just be tempted to order something you’d never have picked from the menu. We did just that – as we watched someone else’s baby back ribs being plated we knew we had to try for ourselves. For the most part, though we allowed the team at Yuu to suggest what we should try. 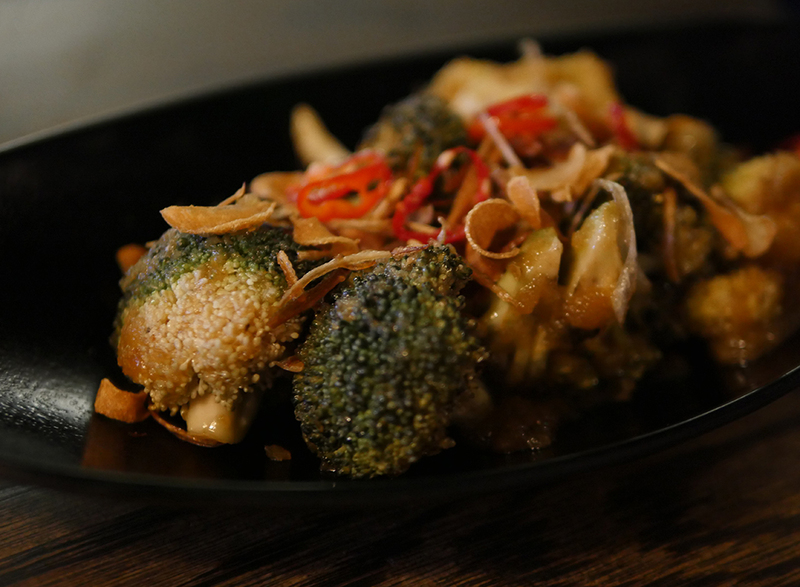 Grilled broccoli with apple and onion dressing, black pepper and fried shallots was cooked on the green egg to the point where there was just a hint of char that cut through the apple and onion dressing. It was a lovely light and vibrant start to the meal and disappeared remarkably quickly! Meanwhile, our ribs were being prepared. As it happens neither of us would normally order ribs but these were deliciously sticky, tender and so easy to eat that I’d definitely pick them again. 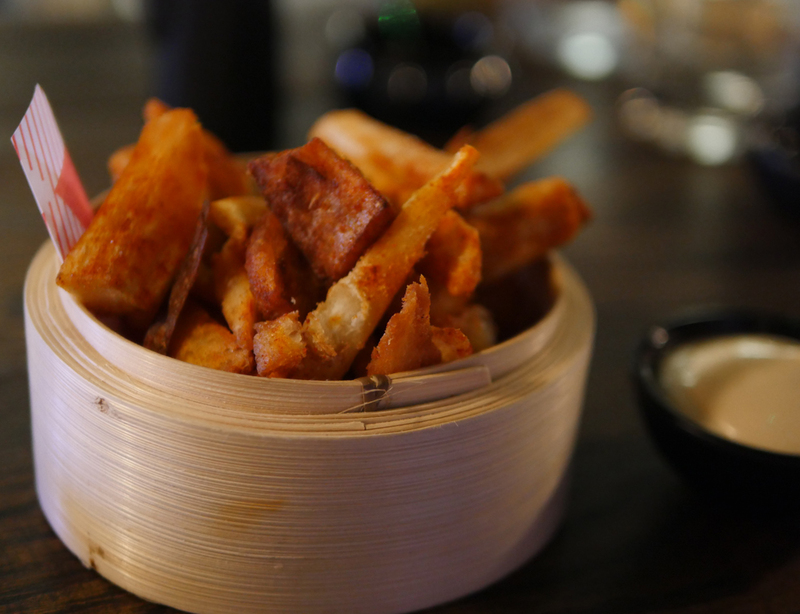 They had just the right amount of toothsome texture and a sweetness and depth of flavour. 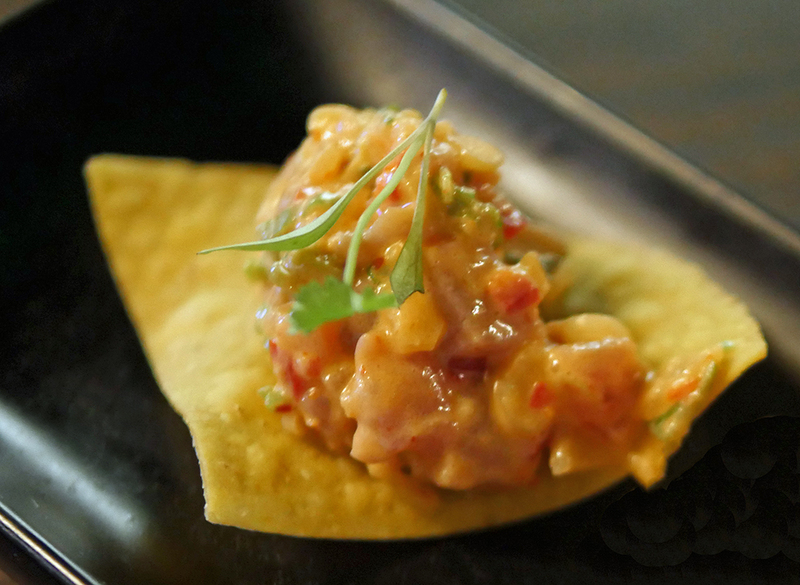 Two spicy tuna tostada, super fresh yellowfin on a crispy tortilla with pickled radish, spring onion and a spicy mayo were fresh, light mouthfuls of flavour. Another dish to add to my wishlist for next time. One of the few ‘misses’ for me was the crispy rice and salmon cakes with avocado and a spicy jalapeno dressing. I liked the seafood and avocado topping but found the rice cakes just a little chewy. That, though, is personal taste rather than a fault of the dish. The dish I’d been waiting for though, the sweet and sticky eggplant, wok fried with a white miso glaze, crunchy shallots and sesame, didn’t disappoint at all. I’m looking forward to using the recipe (which you’ll find at the bottom of this review) and making it myself at home! 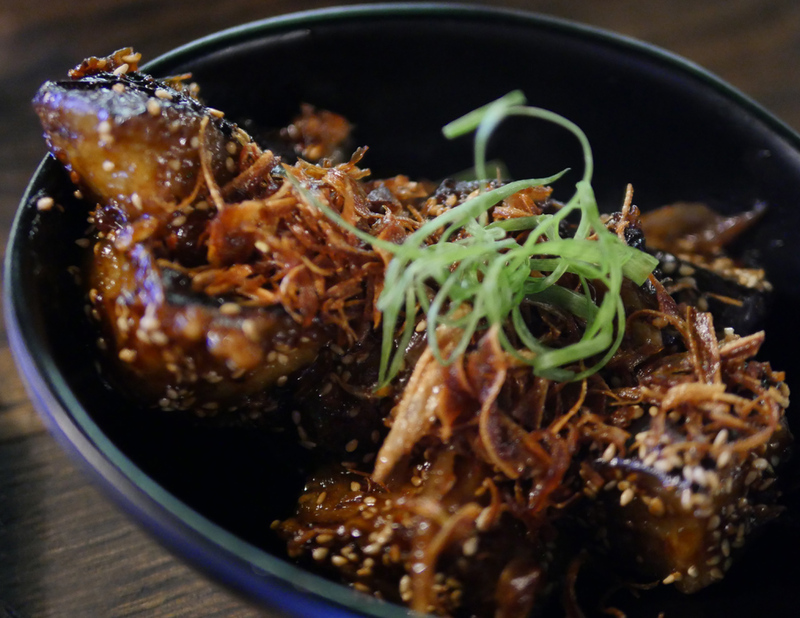 There’s something about the earthy, silken texture of eggplant that pairs really well with the sticky miso glaze. And, if you get the balance of flavours right as Yuu kitchen do, it’s a perfect vegetarian dish. 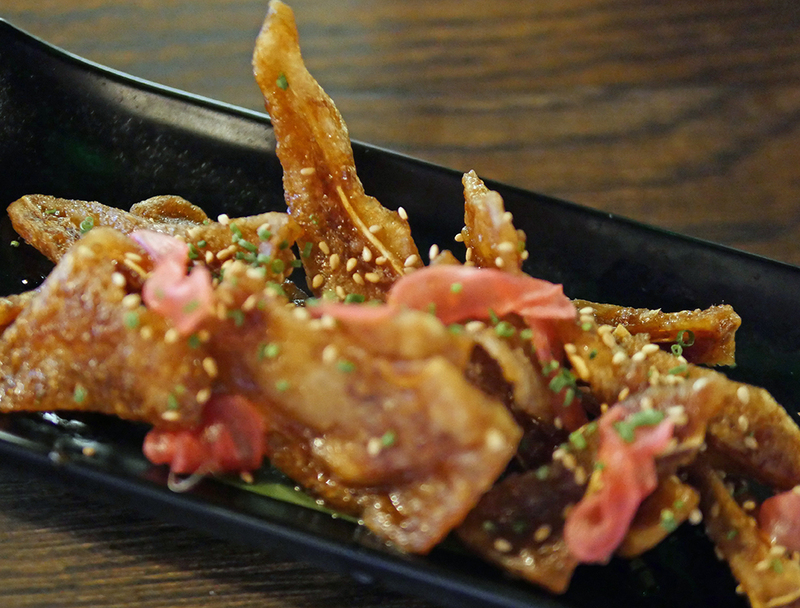 On a more carnivorous note, I enjoyed trying the crispy pork ears. And if I was with a big group, I’d order one plate for the table. But I really only wanted one to nibble on! More successful for me was Lechon Kawali, the 12 hour braised pork belly dish with mama Sita’s sauce, which I’d probably not have picked for myself but which was utterly delicious comfort food. 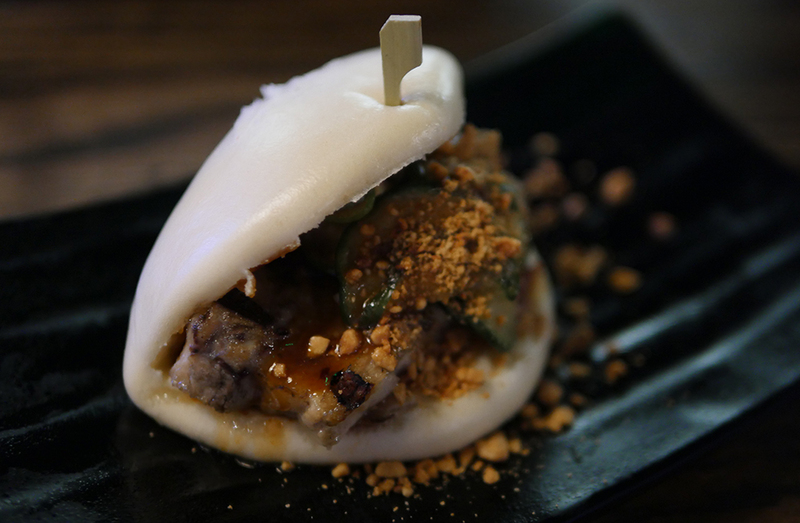 I love Bao, soft pillowy Taiwanese steamed buns. We ordered one each – 7up braised pork belly for my companion and Soy and Buttermilk crispy chicken with Carolina reaper chilli mayo and daikon pickle for me which I loved for the textural contrast and the mix of flavours. 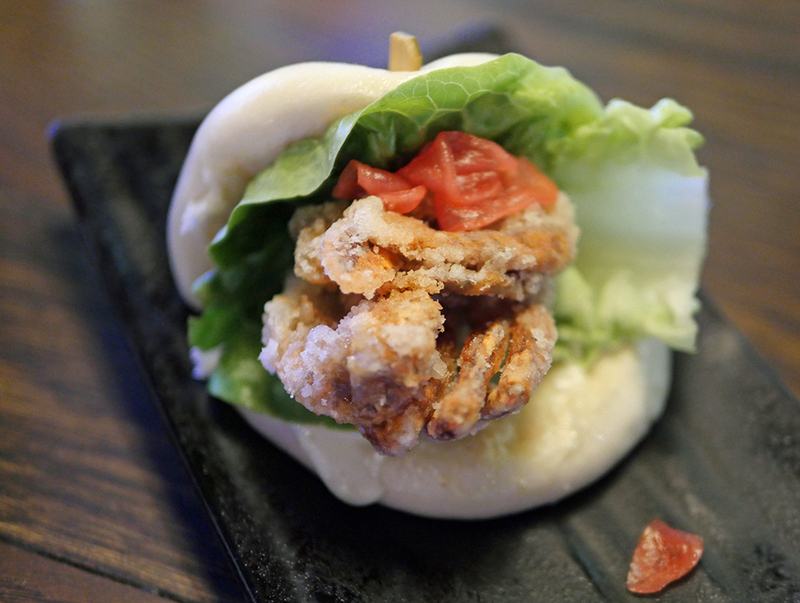 And then I got a serious case of food envy when the man sitting to my left got his crispy soft shell crab bao. That’s what I’m having next time! At that point, we were ready to quit. Yuu Kitchen recommends ordering three to four plates per person and we’d enjoyed eight between us. I can confirm that’s quite enough. But in the interests of research we did enjoy a dessert each. 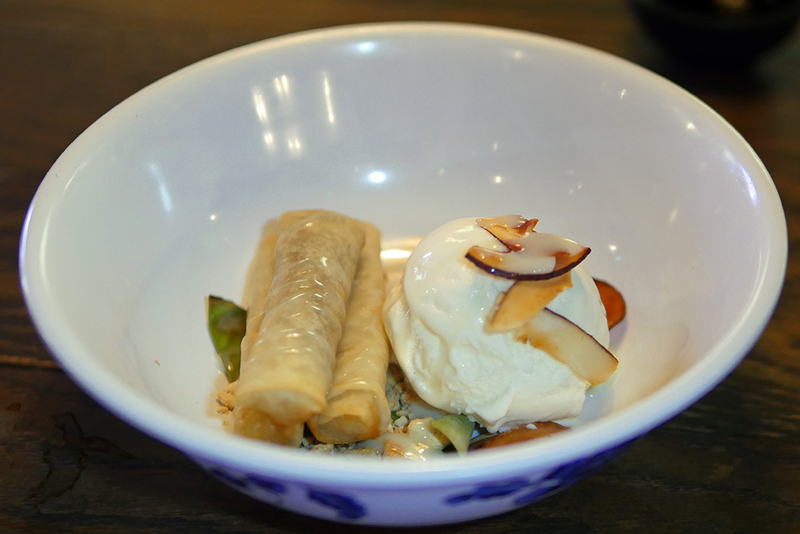 Banana Turon are sweet banana filled spring rolls, served with ice-cream and cashew nuts. The kind of naughtiness that befits the end of a meal like this. I thoroughly enjoyed mine, served with coconut icecream. 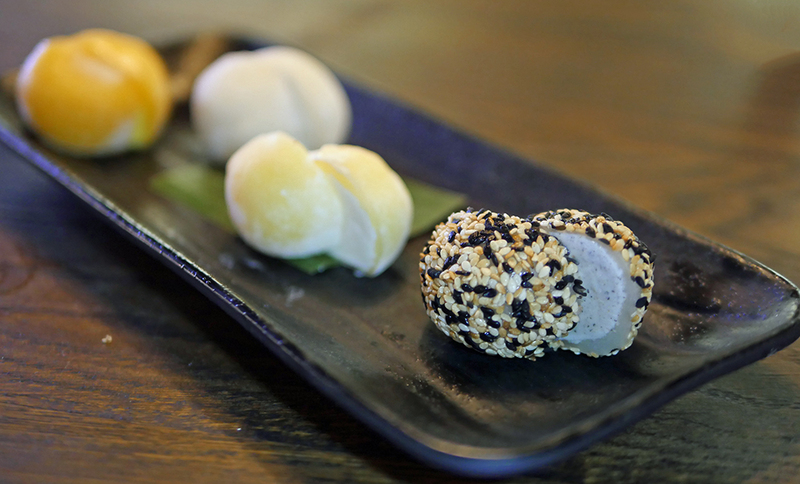 My companion tried a half plate of mochi – one of those Japanese desserts I can’t quite decide whether I like or not. She seemed very happy with her selection, flavours of sesame, zesty yuzu, mango and a creamy vanilla. 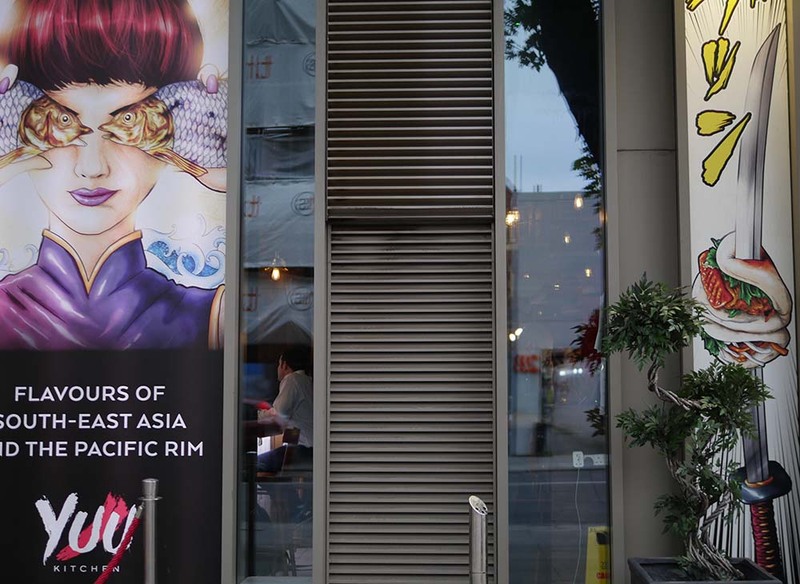 Yuu Kitchen has a short wine list, with red, white and sparkling wine ‘on tap’ at £5.50 a glass. I’m trying to avoid spirits so drank the Italian sparkling wine throughout the evening. But my companion tried a couple of the cocktails which are priced from £8.50 to £10. 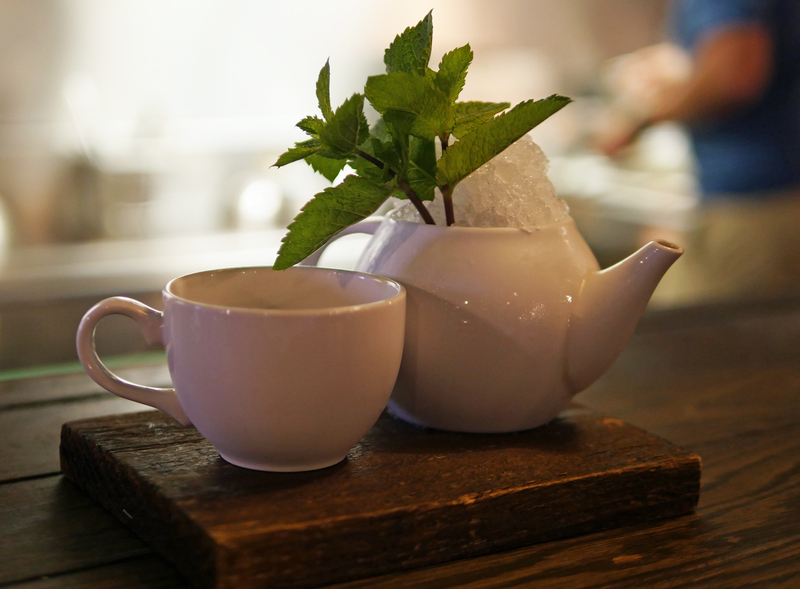 The Oolong Mojito was a quirky take on a classic Mojito, served in a teapot topped with fresh mint. It’s based on Oolong tea which is infused with white rum and then laced with fresh mint, lime, apple juice and sugar syrup. 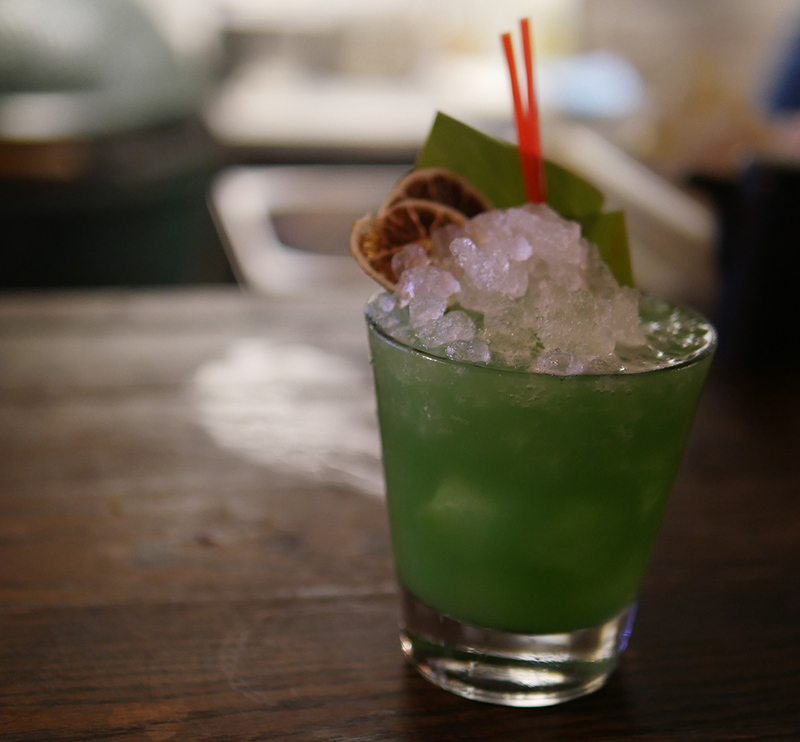 The second recommendation was a vibrant green concoction called ‘The Drunk Calamansi’. Calamansi is a Pinoy citrus fruit used to make a local version of lemonade. Here, with a rum, pineapple juice blue curacao, apple syrup and calamansi juice to create a refreshing citrussy drink. Both looked stunning – and yes, I was tempted too. Next time perhaps? 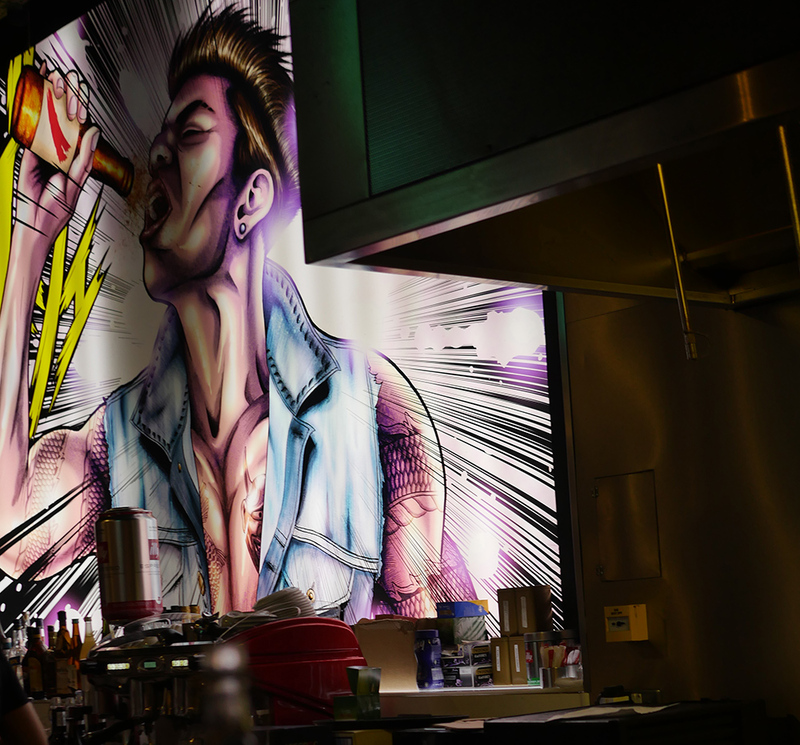 Yuu Kitchen also serve bubble tea, soft drinks and a short selection of bottle and draught beers. Our neighbour and owner of the Soft Shelled Crab Bao was drinking the Yuu Lager which is £5.50 a pint and which was, apparently, very good too. It is, I believe an endorsement for Yuu Kitchen that strangers feel happy to chat through a meal and despite the potential food envy encouraging everyone to order more, this is the kind of place where the prices mean it really doesn’t matter. We were guests of Yuu Kitchen but a meal like ours would cost in the region of £70 for two people. Meanwhile, if you’d like to try the Sweet and Sticky Eggplant recipe for yourself, here’s the recipe, kindly shared by Yuu Kitchen themselves. Dice the eggplant into large pieces and put on a tray with non-stick parchment paper. Oven roast for 7-10 mins or al dente. Serve, garnishing with fried shallots and sesame seeds. heat until sticky. Keep to the side.